Two dockless LimeBike&apos;s shared the sidewalk with bikes from Washington, D.C.&apos;s docked share program, Capital Bikeshare. Have you heard about dockless bike rental systems? It’s one of the newest business concepts to hit the urban landscape, bankrolled by venture capitalists. And much like short-term apartment rentals (Airbnb) and ride-hailing (Uber and Lyft), it’s going to force new conversations about where and how startup companies should be allowed make money — and what role governments should play. A company deploys a fleet of rental bikes around a neighborhood, each equipped with a wireless connection and an automatic locking mechanism that immobilizes one wheel. You download an app, enter a credit card number, and then see a map showing the location of the nearest bike. Before you hop on, the app unlocks the wheel. You pay for the time you use the bike — roughly $1 per half-hour. The first large-scale local test, in 15 Greater Boston communities, will begin this summer. It will involve about 2,000 bikes owned by two California startups, LimeBike and Spin. As you can imagine, deploying thousands of bikes in an urban area — bikes that are easily left anywhere or taken anywhere, even by non-renters — can cause problems. 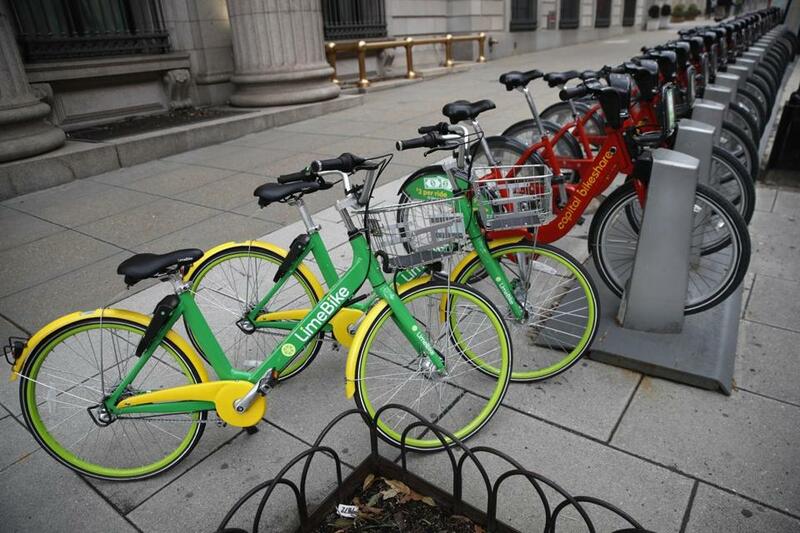 A man in Washington, D.C., was arrested in December for tossing a LimeBike onto the tracks of the Metro. It got run over, causing damage to a train but no injuries. In Dallas last year, a blind pedestrian tore a ligament in his knee when he tripped over a rental bike left in the middle of a sidewalk. The California city of Coronado, near San Diego, banned dockless bikes last year and last month started impounding bikes left on sidewalks and beaches, charging $45 fee for their return. I spotted my first dockless bike in the wild this past winter. It was parked near the basketball court at a small park in Brookline, a futuristic-looking silver-and-yellow model from VBikes, a Texas startup. It stayed there for most of the winter. By March, I got curious, and downloaded the company’s app. It displayed a map of VBikes located a mile or more away, but the bike at the park wasn’t visible on the app. Nor was a VBike I encountered in Coolidge Corner. The two bikes were probably part of a test the City of Waltham launched in November. But somehow, they’d gone “off the grid,” at least as far as the VBikes app was concerned. (Brookline, like Boston, Cambridge, and Somerville, has an exclusive arrangement with Hubway, and VBikes wasn’t supposed to be operating in the town.) I did successfully rent, ride, and return one of these bikes, but it still didn’t show up on the map afterward. VBikes didn’t respond to my phone calls or e-mails requesting comment. Zagster operates its own dockless bike system, called Pace. But Pace requires riders to lock the bike to a stationary object at the end of a rental, which helps to keep them out of the middle of sidewalks, baseball diamonds, and ponds. The Metropolitan Area Planning Council is coordinating the rollout of dockless bikes in the 15 Boston communities, and Kasia Hart says the agency has learned from cities like Dallas, where few limits were put on startups before they began peppering the city with an estimated 20,000 bicycles last year. Robin Chase, the Cambridge entrepreneur who cofounded ZipCar, the hourly car rental company that is now part Avis, is a proponent of the new bike services. Chase says that “it is hard for most of us in our car-dominant society to wrap our heads around this, but really every single mile that is diverted from car travel to walking, biking, or transit is a social gain. Will Boston be able to benefit from the salutary aspects of this new form of bike rental — and avoid the negatives? I’m an optimist — and a fair-weather cyclist — so I’m hoping we can. But the answer will be clear in a year, or maybe two.